The subject of IPAWS comes up often with our customers and it can be a confusing and complicated system to explain. We have put together a comprehensive white paper explaining what IPAWS is, what it can do for you, and how it works in connection with the Rapid Notify system. We highly recommend you download the paper today. What is IPAWS and how does it differ from the Rapid Notify System? IPAWS is an “Alert Aggregator” that passes alerts to various communication systems that then deliver alerts to devices such as cell phones, televisions and radios. It is important to note that IPAWS does not replace existing methods of mass notification, but instead offers new capabilities. Access to IPAWS is free, however to send a message using IPAWS, an organization must procure its own IPAWS compatible mass notification software, such as Rapid Notify. Wireless Emergency Alerts (WEA), also known as Commercial Mobile Alert System (CMAS) or Personal Localized Alerting Network (PLAN), is a component of the IPAWS program and a partnership between the FCC and commercial mobile service providers. Alerting authorities will be able to send CMAS alerts to cell phones, even when cellular networks are overloaded and no longer support person-to-person calls, text, or emails. Several of our customers have inquired recently about the new national emergency alert system and its Wireless Emergency Alerts (WEA), also known as Commercial Mobile Alert System (CMAS) or Personal Localized Alerting Network (PLAN). The system is complex and not widely known or understood. We would like to point out first that the CMAS/WEA system does not replace or eliminate the need for a mass notification system. As a part of FEMA’s Integrated Public Alert and Warning System (IPAWS) program and a partnership between the FCC and commercial mobile service providers, alerting authorities will be able to send CMAS alerts to cell phones, even when cellular networks are overloaded and no longer support person-to-person calls, text, or emails. 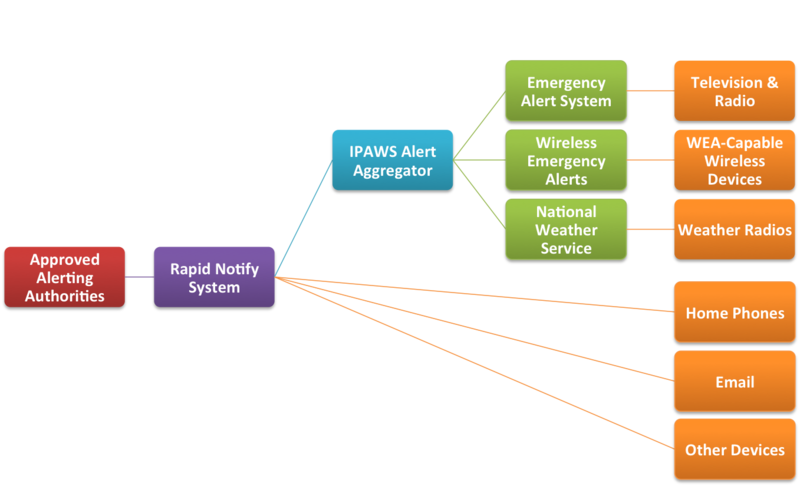 IPAWS does not replace existing methods of alerting, but instead offers new capabilities. While these alerts will appear on a person’s mobile device similar to a text message, Wireless Emergency Alerts are not text messages. Instead, Wireless Emergency Alerts use a different kind of technology to ensure they are delivered immediately and are not subjected to potential congestion (or delays) on wireless networks. Are Wireless Emergency Alerts (WEA) the same as the Emergency Alert System (EAS)? No. Wireless Emergency Alerts (WEA) and the Emergency Alert System (EAS) are different systems. The EAS system is designed for broadcast radio, television, and cable television systems. Wireless Emergency Alerts are designed for cell phones. While both WEA and EAS make every effort to broadcast public safety information, it is possible to see/hear an alert on radio or TV but not receive it on a WEA/CMAS-capable cell phone. What will the alert be? Wireless Emergency Alerts are up to 90 characters in length and will contain details regarding the emergency situation, the agency sending the alert, the area impacted, what action should be taken, and when the alert will expire. The alert uses a unique signal and vibration that is different from an SMS text message. The alert will be stored in the phone’s messaging menu until deleted. Wireless Emergency Alerts originate from Local, State and Federal Emergency Management officials and are sent to participating wireless carrier networks, which then broadcast it to CMAS-enabled phones that are physically located within the geographically affected area. How are alerts geographically targeted? Cell phone owners with a CMAS-capable mobile device physically located in an area where an alert has been sent will have the ability to receive the alert. Because cell towers broadcast in a radius, or circle, their coverage areas don’t always line up neatly with county boundaries, opening up the possibility of receiving warnings for an adjacent county if you’re within a few miles of the border. The alerts are delivered directly from cell tower to cell phone through a one-way broadcast. The Commercial Mobile Alert System does not track or locate individual cell phones or phone numbers. It simply broadcasts to all phones within range. For example, if a tornado warning is issued for a particular county, it will go to all towers that serve that county. Will an SMS Block prevent me from receiving a Wireless Emergency Alert? No. WEA alerts do not travel over Short Message System (SMS) and are not blocked by an SMS Block feature. Will I be charged for receiving a Wireless Emergency Alert? No, Wireless Emergency Alerts FREE, at no charge to you. These alerts do not impact voice, text, or data usage. Can I opt out of receiving Wireless Emergency Alerts? Commercial mobile service providers sell CMAS capable phones with the service already opted-in so that the public does not need to sign up to receive the alerts. You may change settings within your device to opt out of Imminent Danger and Amber Alerts, but you may not opt out of Presidential Alerts. To manage your preferences for specific alerts, go to the WEA application in your device and select and save your preferences. See your device manual for instructions. How do I know if my device is capable of receiving government Wireless Emergency Alerts? Apple/iPhone – When the iOS6 operating system is launched to the public later this year, (available for iPhone 3GS, iPhone 4, iPhone 4S, iPod Touch 4G, iPad 2, and “the new iPad”) iPhones will be able to start receiving WEA messages once upgraded to the new operating system. How does this impact you as a Rapid Notify customer? First and foremost, the CMAS/WEA system will only alert those who 1) have a WEA-capable cell phone, 2) are physically located in an area impacted by an emergency situation, and 3) who have not opted out of the system. This system will not alert landline phones for residential or business locations. It will not alert older cell phones that do not have WEA-capability. It will not alert those who are physically away from the impacted area (meaning you would not be alerted to danger in your hometown if you are traveling outside of the area). These are important distinctions when compared to your alerting capability with a mass notification system that you have complete access to and control over. We welcome your questions and concerns on this issue. Contact us today.